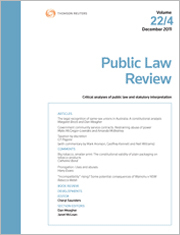 As the title of this article (a revised version of the 2015 Sir Anthony Mason Lecture) foreshadows, its object is to survey, albeit briefly, the use of proportionality in Australian constitutional law. The survey begins with a reference to the debate about the use of proportionality in administrative law and a discussion of the use of structured proportionality in other jurisdictions. After discussing the use of proportionality in areas such as the defence power, the external affairs power and the “right” to vote, the survey focuses on the use of structured proportionality in the freedom of political communication cases, culminating in a critique of McCloy v New South Wales. Since the announcement a referendum would be held to recognise Aboriginal and Torres Strait Islander peoples in the Australian Constitution, there has been considerable debate over the form the constitutional amendments should take. There has been less focus on the precise goal of the referendum, and how the goal influences what amendments should be made. This article hopes to contribute to that aspect of the debate, suggesting there is a general consensus that the goal of the referendum is to recognise a “constitutional relationship” between Aboriginal and Torres Strait Islander peoples and the Australian state. With that goal in mind, it considers the historical and current constitutional relationship in Australia and, as points of comparison, sketches out the constitutional relationships between Indigenous peoples and the state in the United States and Canada. Through this analysis, the article develops points of guidance for the current debate in Australia. While the 2016 prorogation of the Commonwealth Parliament was uncontroversial from a constitutional, if not a political, point of view, the advice to the Governor-General did contain one controversial statement. It asserted that there is no known example of advice to prorogue and recall Parliament being rejected and no known suggestion that there is a reserve power to reject such advice. This article addresses the question of whether or not the vice-regal power to prorogue Parliament may be regarded as a reserve power, what precedents exist in relation to the power to prorogue and what views on the subject have been expressed by practitioners and scholars. It concludes by considering the circumstances in which a Governor-General would be entitled to reject advice to prorogue and the relevant constitutional principles that would guide such action. For the PDF version of the table of contents, click here: PLR Vol 27 No 2 Contents.